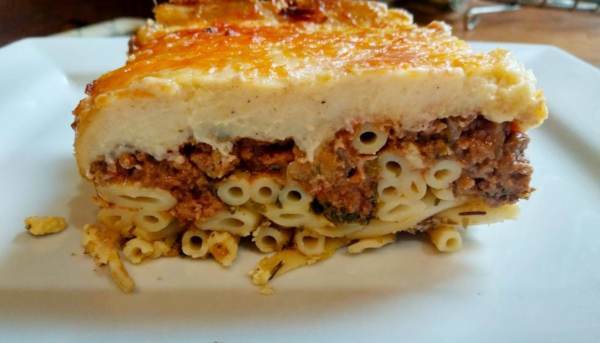 Pasticcio! The word is Italian and means ‘mess’ 🙂 Greeks love mess though and anything yummy tasting! A favourite Sunday dish and a beloved treat! There are many ways to prepare it. Fast and easy, long and tasty, with spinach or not, with cinnamon or not, with nutmeg or not… Here we’ll show you an excellent version of it! Time needy but oh-so-delicious! In a pan on a high heat we sauté the finely chopped onions into 2 tbsp. olive oil, 1 tbsp. sugar and our thyme and we wait until caramelized. After 3-4 minutes we add the garlic and continue to sauté. Then we add the tomato paste and saute it for at least 2 minutes. It is important to saute our paste because it will give to our mincemeat body and taste. We add our ground beef and we ‘break’ it for 4-5 minutes, using a wooden kitchen spoon. We saute until our mincemeat gets a nice colour. At this point, if needed, we add an additional 2 tbsp. olive oil. We add our wine and wait for it to completely evaporate. We add the diced tomatoes, the cinnamon, the 2 cubes of beef bouillon and our Kirian Mediterranean Bay Leaves. We turn the heat down and slowly cook for 10-20 minutes until the liquids of the mincemeat have evaporated. When our mincemeat is ready, we remove the bay leaves. We put the pan aside and add the parsley. We warm up the butter in a pot on medium heat. We want it melted but not burning. We add the flour and we stir well with a whisk for a few minutes until the flour mixed in well with no lumps. We make sure to add the flour to the side of the pot so that it does not burn. We start adding 1 litre of milk in small doses and we whisk constantly in order to have a creamy Béchamel. At the beginning, our mixture is pretty stiff and needs patience to become a nice consistency, but the more milk we add, the better it becomes. When our Béchamel starts becoming thicker we need to pay even more attention, stirring all the time! We don’t want the milk to burn! When we see the first bubbles, we remove from the heat. With our Béchamel off the heat, we add salt, pepper, nutmeg, 100 gr grated gruyere and we stir to lower the temperature. Finally, we add the 3 egg yolks and we stir once again. In a pot with salted water, we boil our pasta for 2 minutes less than the package instructions. We add the olive oil and put aside. Since we are also baking our food, the pasta will be cooked some more so we boil it less to prevent overcooking. We add oil to the bottom of a baking pan ( 25*35 cm ), we strain our pasta and transfer it there. We add 2 eggs, lots of thyme, ½ bunch parsley, our feta cheese broken in pieces by our hands, salt and pepper if needed. We mix everything very well and put aside. We heat up our oven to 355 degrees Fahrenheit. We add to our mincemeat 1 ladle full of Béchamel and we stir well to combine the sauce. We place our mincemeat over the pasta and then the Béchamel over the minced meat. Finally, we add on top the grated gruyere we have kept (50 gr) and some little pieces of butter if we like. We bake for 40 minutes or until our Béchamel gets a nice colour. We remove from the oven, let the food cool down for 30 minutes (that’s the hardest part of all!! Looking and not tasting! :P) we cut in squares and serve.